Today’s message is for our animals. Our animals are precious, each one of them fulfilling a very specific purpose on our planet. From our beloved pets, to the ocean and wild animals, let us send healing, support and love to all those involved in working with all God’s creatures.They need us, and even if we cannot directly participate in a specific cause, we can also contribute in other ways i.e. sending prayers of love and healing, volunteering to walk dogs or play with kittens at the shelter. All animal beings are placed on this Earth with a specific purpose, some of them to help teach and enlighten human kind. Animals are often presented to us to help with healing. The way in which we treat all animals, the honour and respect we show all living beings, is a manifestation of how we assist the earth and all its beings on the path to ascension. 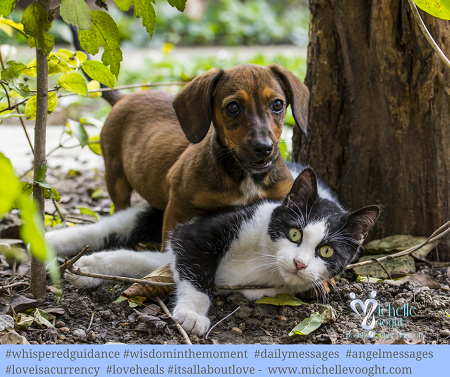 You are guided to work with the animals or to show love and concern and be a voice for them. Even if you cannot look after them physically, you can call on Archangel Fhelyai, the Angel of animals, to look after them and Archangel Michael to protect them. If you feel guided to volunteer at animal organisations, or even consider a career in working with animals, this may come as a confirmation for you to pursue this purpose. Your healing thoughts, vibrations and prayers will help; they are seen and heard by God and the Angels. This card also comes as a message from one or more beloved pets in Heaven, thanking you for taking care of them and letting you know that they are safe and joyful.